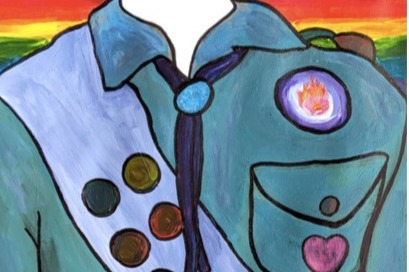 Queer Scouts is a prairie-based leadership program for queer and trans youth between the ages of 14 and 24. With a focus on solidarity and intergenerational mentorship, we empower young LGBTQ2S+ leaders with the skills to organize for social justice in their communities. The Edmonton LGBTQ2S+ community was shocked and discouraged when a local summer camp for queer and trans young people was shut down by the University of Alberta in 2018. A group of seven queer and trans youth who had been working to plan the camp were devastated, but they didn’t give up. Inspired and called to action by a wave of youth organizing on issues like climate change, gun violence, and police brutality across North America, the group decided they would plan a camp of their own. This camp, they promised, would truly serve the community, and it would be led by the very youth who need it most. It would build on the local camp traditions cultivated by campers and volunteers for over a decade in Edmonton, while also shifting to meet the needs of LGBTQ2S+ young people in a rapidly changing world. WE ARE CURRENTLY FUNDRAISING for CAMP 2018 (July 23-29, 2018 - Pigeon Lake AB). Camp QS will take place on Treaty 6 territory at the Tangle Trees Girl Guides campsite, located on the banks of Pigeon Lake in central AB. In a lot of ways, we’re just like any other summer camp! We have recreational activities, arts and crafts, all-gender swims, and nightly camp fires. What makes us different is our focus on LGBTQ2S+ youth leadership and social justice! The beneficiary of this campaign, Damien, is a Queer Scouts camper and volunteer organizer, this is an example of youth supporting youth - an integral part of the Queer Scouts vision. This campaign was created before Queer Scouts had its own bank account set up. Due to time constraints the organizing committee agreed that the funds would be withdrawn into the beneficiary's personal bank account and would be moved once a Queer Scouts Account was created. As of June 7, 2018 Queer Scouts opened our own bank account. Moving forward all the money raised through this campaign is withdrawn by our beneficiary - Damien - into his personal account and then a cash withdraw is made and given to our treasurer to deposit into the Queer Scouts account.